For those born March 16, 1937. You're one of the first people who's never lived in a world without Keynesian economics. John Maynard Keynes articulated an early version of his famous theories in our pages in May 1932, arguing that the United States should spend more, not less, in order to curtail the worsening Great Depression. You were born in March of 1937. This year, The Atlantic celebrates its 160th birthday, making it 2.0 times as old as you. The year you were born, Henry C. Wolfe wrote about how the Third Reich's expansion would affect the various nations of Eastern Europe. He made these predictions two years before Hitler invaded Poland. Around the time you were born, William Hastie was confirmed as the United States' first African American federal judge. In October 2015, Michael O'Donnell wrote about the early legal career and civil-rights legacy of Thurgood Marshall, who became the Supreme Court's first black justice 30 years after Hastie was confirmed. 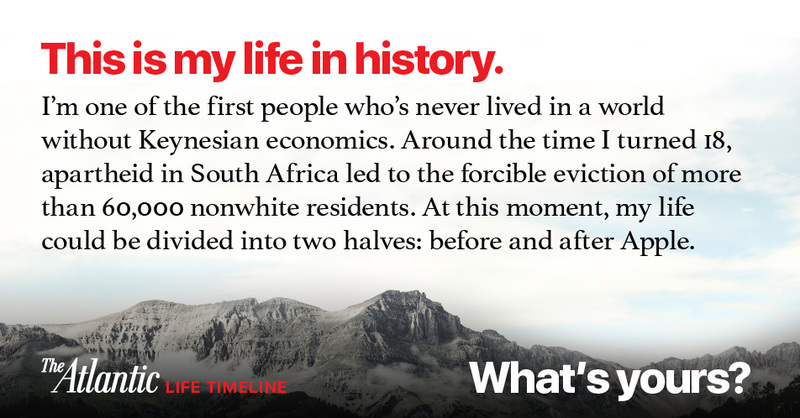 Around your 18th birthday, apartheid in South Africa led to the forcible eviction of more than 60,000 nonwhite residents. In September 2016, Kenichi Serino wrote about how apartheid continues to cast a shadow over South Africa. At 32 years old, you were alive to behold people walking on the moon. In 1972, Jane Fonda, who was born the same year as you, won the Academy Award for Best Actress for her role in the movie Klute. In the July/August 2005 issue of the magazine, Tom Carson wrote about Fonda's "incoherent" life. Your life can be divided into two halves: before and after Apple. In September 2015, Megan Garber wrote about the professional genius and personal failings of Apple founder Steve Jobs, and a new documentary that considered his mixed legacy. When you turned 70, you watched humankind reach the outer solar system.